Have your new doctor contact your old doctor as to why he/she prescribed the Diazepam. Tell her that if she feels it is not an appropriate medication then she needs to do something else. ie sleep study, new medication etc. Tell her that this problem is interfering with your quality of life. You need to stand firm with doctors. You know your body and they need to work with you, not tell you what to do. If this doctor doesn’t work with you to keep you healthy then you should find a new doctor. Good luck. So sorry you or anyone is going through this hell. 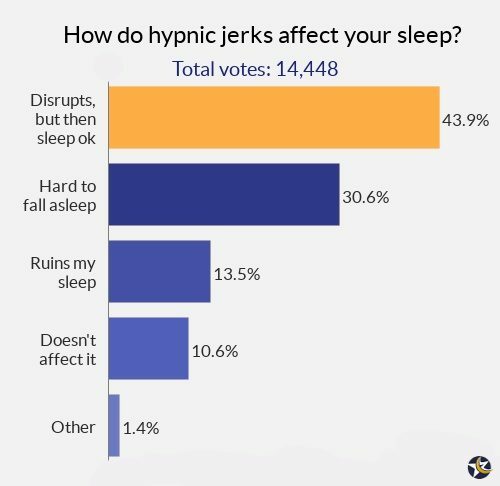 I too have the hypnic jerks. I can’t find a doctor that takes me serious. They act like it’s no big deal that sleep is just an option? I have found a way to make my jerks livable after 2 1/2 yrs. if I juice with no fruit. No sugar, and light carbs. I can most night now fall asleep and am finally getting were I am sleeping longer . I do have bad nights for which I will take an Ativan because the jerks are relentless but for the most part staying on a diet with lots of fresh raw veggies has been a life saver . I also take Doterras essential oils the peppermint one. I put a drop on my tongue and do breathing techniques. Deep breath slow exhale for a count of ten. It’s been a while for me so keep trying till you find what works for you. The docs have no clue. God bless also lay off the booze. Helps you fall asleep but not for long and then they get worst. Solution for me found: Readers Scrap all of my posts before now. The take away from those is that I have been trying to decipher this problem for 20+ years with no answers from doctors. However for the first time in 20+ years, after fasting and realizing caffeine and sugar aren’t in my body, and I was still having symptoms, I now believe it’s a mineral deficiency, but not just Magnesium but get ready……….Potassium! Yes Potassium is the silent culprit. It regulates the heart. This is why I feel an electric pulse in my chest jolts falling. Thanking God that I had taking a blood test in June, and could see my potassium levels were low. So, Taking antacids due to Gerd depleted me of the Potassium. Two bananas (potassium) a big spinach salad (magnesium) later, I slept six hours last night when I have missed weeks of quality sleep due to the falling feeling every hour and tachycardia. I sleep in a recliner most nights during to GERD just side note. Bottom line poor diet and mineral/vitamin deprived. It has taken 20 years to learn this even with going to doctors and ER intermittently. Maybe have a doctor run a test for vitamin deficiency. Prayer for knowledge was also a contributing factor. You’re welcome. For me it has been like solving a puzzle for three years. The breakthrough for me came when I came here and I consulted with a Canadian pharmacist. What has worked for me is melatonin, magnesium, minerals, and nothing that makes me hyper like caffeine, msm, l-carnosine, and free glutamates. If I drink hemp milk with carageenan, for example, the jerks come back. Hey everyone I was the person that left the message about GERD. Since then I have been fasting to reduce GERD, and stumbled upon new info. Well the biggest culprit may be sugar or caffeine. Leaning more towards excessive sugar. Guys I am prediabetic so yeah I love, and I am addicted to sugar sad to say. I experienced hypnic jerk in my early 20’s after I became pregnant. I never drank coffee, but it was caffeine through sodas etc., so kinda dont believe that’s it. Anyway, when I fasted last week, I didnt have sugar or caffeine and slept well, great in fact. Starting eating/drinking both again, the jerks, started back. Fasted again it stopped. The sleep I got yesterday was such a deep sleep and relaxing. Anyway, I still believe it’s all linked together somehow (1) sugar primarily, (2) foods that trigger Gerd, and possibly (3) caffeine. I believe the culprit is in the bad diet. I hope others post their findings if they cut back on these foods. Maybe we can all find a solution together, pass info to other sufferers, and finally get good sleep. Fasting from sugar was like stopping an addiction; not easy but worth it for a nights rest. Try Swedish Bitters for your Gerd, not the bitters you use for putting in alcholic drinks but a good mixture for the stomach I use one called self Heals original made in New Zealand , but I am sure any good herbalist could make you one up. Reading this article helped me realize how normal the jerking is, but I didn’t even find it too abnormal before. It was never something I worried about, because I fall right back asleep after experiencing them. It’s fun to research though… I only have hypnic jerks when I sleep at a desk with my body folded forward (which is of course pretty uncomfortable), and I always feel the sensation of falling towards the floor, like I’m tripping down a flight of stairs, and then I wake up with a jolt and see that I’m fine. This has been happening to me for about 5 years. No matter how exhausted I am, I’ll lay in bed and just as I am falling asleep my body will jerk awake, sometimes just my arms or legs will jerk, but it’s enough to not allow me to fall asleep. This will go on for hours and hours. There’s also a feeling of an “electric shock” that goes through my whole body and then my heart starts racing. Before, I attributed to caffeine and alcohol and stress. But I am now 5 weeks pregnant, haven’t been drinking caffeine or alcohol, and I don’t feel stressed about anything in my life. I know it could be hormonal but since it’s been happening for almost 5 years now I feel like it’s a more serious matter. I can’t take any sleep drugs because of my pregnancy, and the magnesium and melatonin and natural sleep aids aren’t working at all. Reading the comments about the GERD does interest me because I have been experiencing acid reflux since I got pregnant. I’m just very worried for my developing baby because I’m only getting 2/3 hours of sleep a night. I don’t know what to do. Please help! Update: So this episode; 3 days of hypnic jerks; now gone. I was on my third day of Nexium (taking early morning; take 4 days to have full effect) and the Alka-Selzer relief chews with 700 mg of Calcium Carbonate (took two before bed), along with Mylanta (correction I initially said Milk of Magnesia; point being Magnesium is needed) This seems to have done the trick for me as usual. Before taking the Calcium it was the same feeling in my chest which I equate to shortness of breath (feels like falling), and now that I think about this some more, muscle contractions is probably the feeling of falling or electric feeling it makes more sense than it being result of Adrenaline in the body, but the Adrenaline could make the body more prone to it. One of my jerks was hard enough, it felt like I was about to fall out of my recliner. I stayed calm by each time thinking okay my body is telling me I still haven’t cleared my airway; this calm thinking deactivated the fast heart rates too (I had none! ); but the feeling of being discombobulated upon awaking is the worst still. Took the Magnesium, first it had slight improvement but GERD was still present slight jerking still. Calcium always clear GERD the fastest for me. Tried it immediately on attempt to sleep the jerks are GONE (YES!). But very slight feeling in my chest still, but not enough to sound the jerking system. Two more attempts to sleep, slept like a baby. This has been my experience over 20 years. The acid reflux is so severe I go through about a week of no sleep and have to try these remedies with Magnesium and calcium. One day I may have to consider prescription for my GERD on daily basis. Over 20 years I took a sleep aid twice for one night ea episode. My thinking behind that at the time was to train my brain not to remember the sleep trauma (that was misguided). I dont use sleep aids, I like the brain to work through it because it gets so used to things too easily. I dont like taking meds, but I think I will start taking something like Culturelle probiotic for now to prevent this from happening at all. I believe hypnic jerking is the body signaling you that it is some danger in sleeping, such as restricted air, too much pressure on limbs, etc. For me I believe its low air supply due to GERD. It probably signals for a whole host of illnesses that could be harmful if you were to sleep a long period of time in that condition. The system is kind of your friend; I said kind of lol. I hope this helps someone out there. Not in medical field please check with your doctor. These are my experiences. Let me add couple more things. The falling sensation after Jerking due to GERD doesn’t start until I have had like 4 episodes of rapid heartbeat. I am figuring the falling feeling or electric feelings happens at that point for me, because my body is full of stress/anxiety hormones; and that is what is causing the sensation along with the jerking. At first it’s the jerking alone due to collapsed esophagus (I’m guessing). I sleep in recliner too during this time. Then the secondary problem of feeling of falling happens. My plan today is to burn off some of the stress hormones. Also Milk of Magnesium gave my chest the most relaxing feeling out of all the products I named. I was able to doze off more than usual with the nervous feeling of falling not being so prominent. My wife woke me last night and said that I was kicking her and this morning she said that I had been kicking her all last night. The last thing I remember when my wife woke me up was that I was in my mind kicking the hood of a vehicle. She also said that I sometimes I would holler out or moan very loudly. This has happened several times over the last few years. I wear a cpap mask for snoring. This does not happen every night and it is affecting my wife’s sleep and affects her day the next day. Please advise as to what I can do. Thanks. Speak to the doctor who prescribed the cpap. It might be another sleep disorder they need to look into. Has anyone found a good non-drug solution to these hypnic jerks? They always start with me after a really stressful time, and then I start obsessing about them, and can cause them to happen by thinking about them. I know for me, they’re probably mental, and due to being overly sensitive as I fall asleep, but I literally cannot stop them. Ambien is the only that works. I used to be able to fall asleep again after it wore off, during previous episodes but not any more. I feel like I’m not getting restorative sleep on the Ambien. I feel like I’m only getting a few hours a night, even though the Ambien is getting me up to 6 or 7 hours of unconsciousness. I feel terrible all day. Due to this, and the added Anxiety, I am losing grip during the day too. Basically constantly either worrying about health or sleep. I really don’t want to go on anti-depressants like last time, and would like to get through this on my own. Your comment nailed it for me. I am going through high anxiety and stress right now. My jerks are getting strong and frequent, it almost hurts. I’m hoping soon I will be able to reduce and get rid of my anxiety. I wrote a post earlier about my experience. Have you read it? In my way out of this mess. And its all about knowledge. Thank you for your coming back and commenting further to help people. I am going to take your advice and be less anxious to stop them. Do you recall how long it took to hit a good nights sleep after you realized what you needed to do? I get these after I’ve been on a long overseas flight. Every time. For the first few days after I arrive at my destination I will not only experience at least 1 full body jerk, but some mini jerks in feet or legs as well each time I go to sleep. I also get severe toe cramps in both feet on my first day back from a long trip. I drink more water than most people I know on any flight, at least 2 liters or more. I do not sleep on the flights either. So I’ve always arrived thinking I’m dehydrated and low in minerals…I drink a lot of water when I get home or or other place, take a hot bath and begin taking magnesium. Yes, and eating a banana or apricots if they are availabe. The toe cramps only happen the first day. The body jerks happen for 1-4 days. 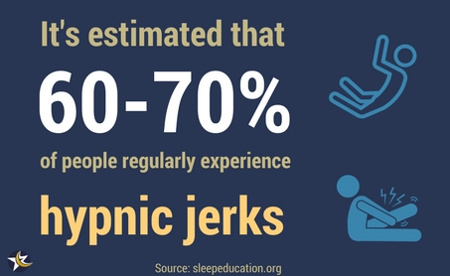 I now think from what I’ve read, it makes sense that the jerks may occur from sleep deprivation, because I am essentially missing an entire nights sleep, about 22 hours of door to door travel. I am truly exhausted when I arrive, part zombie. On another note, I do remember getting these much more regularly when I was younger in my 20’s. A phase of them would usually coincide with stressful events, exams, projects, depression…so I chalked it up to stress after really paying attention to the times that it was happening and what was happening in my life as well. Good luck to everyone, hope I helped a bit. I go to bed, I fall asleep fast.I don’t have issues with sleep but anytime of the night I get shocks to my heart and it wakes me up, sometimes they are severe. I’ve had my heart checked out I’ve had acid reflux test and nothing seems to be wrong with me it can happen 45 minutes after sleep it can happen 2 hours after sleep, it’s kinda spooky and I get up take a light snack than pop some vitamin and go back to sleep and wake up in morning. Some shocks are light and some are hard. I read what other people say, I have seen all doctors and no one seems to help me, any suggestions? Thanks for trying to help. Hi, Maria! I used to get the same thing as yourself. I had my heart checked at the ER and then by a cardiologist (all checked out well). After checking and finding out that I have high calcium blood levels and the effects that too much calcium in your blood stream can do to your heart ( pain, electric type feeling, skipped beats) no fun. The cardiologist gave me some calcium channel blockers, and I took them all of five days, and they helped but I didn’t want to continue taking them; so I stopped. I researched and found out about vitamin K2 (as little as 100mcg). And since then- no issues. If you decide to try vitamin K2, take it along with vitamin D, as to the two combined will guide calcium to where it needs to be, and the K2 pulls calcium out of your blood stream and redirects it to your bones, teeth and wherever else it needs to be. Everybody should seriously consider C.B.D oil. 2 / 3 drops under the tongue 2 hours before sleep. You may still experience the “ jumps “ but the adrenal response doesn’t seem to materialise after. This is the underlying problem , almost more than the actual jerks and jumps themselves. As the response to them makes them worse. It’s almost like it’s a cycle. As the emotion reduces , so does the anxiety response. Then it just becomes a “ thing “ which one can live with. Although in my case it’s reduced every now and again. And even when I does , I’ve made friends with it. Remember, what we think about , we hold hands with. I had, for the first time ever, a tremendous “jolt” that actually shook my body and the bed. The jolt was somewhat the same as seen in using shock to start the heart. The body ‘jumps”. I have a pacemaker so I sent a transmission to my cardiologist to see if it should the event or something. The answer was no evidence of anything–no skipped beat or A-fib. I was extremely shaky and frightened, my blood pressure was high. Of course there was no answer–I have some of my own theories > I recently, 2 days prior had abdominal surgery. I don’t think the anesthesia was totally out of my system. I didn’t think about Benadryl until I read your article. I had taken several doses for an allergic reaction. Maybe that and the anesthesia was the culprit. I live alone so don’t know if I snore. Very strange malady —hope it doesn’t happen again. Is this kind of hard jolt common? I don’t know about common but I have about three of them per year. Wakes me up completely with hart racing but fall back to sleep 15 minutes later. I am a 51.5 year old African American female that is menopausal and experience Hypnos jerks but don’t know to do about them. I often become afraid and anxious prior to bed time! May I add that I have also been diagnosed with sleep apnea! Are there any possibilities of me ever experiencing a good quality of sleep again? What everyone is experiencing with these hypnic jerks is a demonic attack. Whether you believe in demonic attacks or not,I assure you that is exactly what is happening. I experienced them for a while and still do on occasion. One way that stops them every single time is to play a spiritual song, entitled ” nothing but the blood of Jesus.”… I can usually feel the presence in my bedroom when they are getting ready to happen. I go to YouTube and play that song a few times in a row and it works every time in stopping the hypnic jerks. You can also pray for protection before you go to bed asking the father to please protect you from these attacks with the blood of Jesus. There is a website I think it’s called play on repeat. Com, where it will play the same song over and over. Try playing that song for yourself and you will see that it will stop the attacks. Praise God. I feel like this is what is happening to me. I know it sounds crazy, but it’s like I hear something sort of growl before it happens, and then it’s like something grabs me and shakes me awake. I have a cross above my bed for that purpose, and I wear a cross necklace. Last night I didn’t have it on and this happened again. I got up and put my necklace on, and held onto it and prayed. I hope there’s no such thing as that, but I’m so scared of it. I’ve had so much anxiety, and trouble sleeping since I had my baby, but this would happen periodically before. I read your comment, and thought oh my gosh! I know it sounds crazy, and I am not one to believe in ghosts and stuff, but it does really scare me! I can’t watch movies or anything about that because it scares me so much. Not a valid opinion! I am a yoga teacher and I don’t think about it and it still happens to me. I get the same thing as you. I think i have zeroed in on the culprit for me: free glutamates. Whenever I eat something like coconut ice cream, for example, the thickening agent is carageenan or locust gum. I found out that those foods have high levels of of free glutamates. I eat those and I get jerks at night and in the morning. I do not eat those, and up my intake of high magnesium foods and I do not have any jerks. Try researching free glutamates and how to remove them from your diet. That might work for you. Two things… I have been on Effexor for a few years and about a year ago I had the prescription increased slightly. After that I experienced crazy night starts. They were quite random, but I thought that perhaps they were related to Effexor. But, if I’d choose night starts over Effexor, I choose night starts. I also noticed during this time that I mostly get the night starts during PMS. I’m also close to 50 and peri-menopausal. Now I wonder if it’s more hormonal than anything? But recently the night starts have gotten quite intense. Last night it felt like an electric shock, with bright flash of light and I woke up pounding the bed with my hand (3 times… as always seems to be the case). It was intense and they seem to just keep getting more intense. I think mine is anxiety related. I am afraid of sleeping too deeply, out of fear of not hearing or not waking up when someone might be trying to break into the house. Subconsciously, I am afraid of sleeping. The moment my brain realises i am falling asleep, I panic and jerk myself awake forcefully. This happens every time I try to sleep, together with constant muscle twitches. Any sudden noises give me such a fright, that it triggers the fight-or-flight response from which I recover very slowly. The result of all this is Pseudo-insomnia. I am so weary of this. Don’t know how to fix it. I fear that sleeping aids might make it worse. Try putting a chair under your doorknob. No one can get in then, which will put you to sleep without worry. Has it gotten better for you? I have been experiencing these jerks very frequently every night for about 2 weeks. I have hypnic jerks for two yrs. juicing and low sugar intake even fruit is a no no. Liquid minerals help too. I still get them but I can eventually get to sleep and my sleep is way better. God bless! I’ve always had sleep onset insomnia. Then migraines starting around 25 years old. I’m 43 now and I guess I had them almost daily. I started taking remeron at the end of 2017, it helped me fall asleep and stay asleep, and no more migraines. But I get painful twitches before sleep now. They were never painful before. So I came to the internet for answers only to find it’s just theoretical. But I do want to say that a lot of those suggestions are just good life habits to have. Could I get some feedback as to the situation and frequency for all os us suffering or who have suffered? 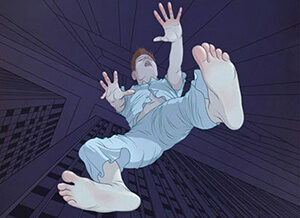 I have experienced the traditional hypnic jerk when falling asleep. The tripping or falling dream just when you first fall asleep. These to me feel normal and common. It might have happened once a week for the last 20years for me. However a different version reared their ugly head in the beginning of November. These have an electric like feeling that generates in my stomach/heart area. These also don’t let up when they kick in. Every time I drift off it is like the paddles are on me and I am jolted awake. It can go on for hours until my body is so exhausted it gives in. Then after a few hours sleep I am awake and the cycle repeats or I just get up. I did have a major change in anxiety when these fired up. However I have been working had for two months and have made some major advancements in my anxiety levels but am still suffering 1 night a week of continuous jolts. I am under the care of a neurologist and on gabapentin and baclofen for 3 weeks but they are still happening. I was dooped into these meds as I want to handle this as naturally as possible as that is where I saw my biggest gains. Any insight is appreciated. Have you received any medical diagnosis for what’s been happening to you? Wow Nate the exact same thing happens to me, has also only been for a few months. I agree this is nothing like the tripping, falling dream … very different, also starts in the stomach/heart area then a huge jolt into the air sometimes my back arches, it is becoming really scary. I did have dengue shock syndrome a couple of years ago. I did not realise this affects so many people. I have full body spasms on awakening, which are quite frightening, and I am definitely awake after one of these! The short hypnic jerks at night are more disturbing, difficult to fall back to sleep, even these are quite mild compared to the morning spasms. I am taking gabapentin in quantity for chronic pain, so I had just assumed this was a side-effect of this epilepsy-related medication. Has anyone else experienced this with gabapentin? Im same Lou ,every afternoon ,i hate it my dr has no ideas ,maybe its a baby boomer thing ..im also on medication for pain plus c.o.p.d dont know if thats why i get them sic of it..stay well.. I left a comment ding I take Gabapentin. I take Baclofen, also. And I have this jerks…mainly when I’m sleep deprived and have taken Adderall (prescribed) that day. Yes, I take Gabapentin. I didn’t relate my jerks to Gaba, but you are the second person in just a handful of responses that mentioned this. Hmmm……. I Am Wondering If Gabapentin Is Causing Mine… I Take 2000mg At Night Before Bedtime… Having Sleep Study Tonight…!? Ive had it for 3-4 years on and off. This last year i have had max 2 sleepless nights. 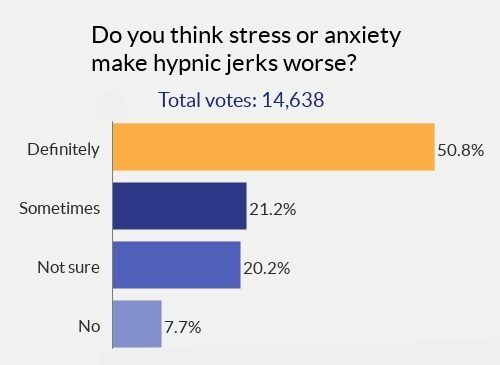 Im sure the Jerks comes as a consequence of nervousness/anxiety. The big game changer for me: i realized that the Jerks are a mechanism to get rid of nervousness and allowing sleep. They are actually coming to help with the sleep transition. They are good not bad. For more than two years i saw Them as bad for my sleep, and i feared Them, which increased anxiety. When the Jerks Came my Heart pounded and recurring thought of not getting any sleep that night ultimately leading to my demise ruled. Now i understand that its only natural that i did not get Any sleep because of These dreadful thoughts that continuously built Up anxiety in me . IT was a vicious spiral. I broke this spiral… Now i may get the Jerks sometimes but i see them as a good thing, as a helping mechanism, and i quickly fall asleep. Within seconds/minutes. Today i can sleep 8-9 hours with ease. I am so thankful that i Came to this realization. I recieved No constructive help from my doctors, only pills… I totally support the suggestions about good nutrition and hydration, but in the end its a mind game. Anxiety dehydrates.. if you loose the anxiety the risk of dehydrating also decreases.. its all connected.. i Hope my story can inspire you to break the negative spiral. It does! Many of these forums don’t include success stories! It is unfortunate and discouraging. I too have only been thrown prescriptions which have only masked it for a short time then another night of hell. Can I ask when you get/got these were they just a jerk or was there this jolting electric feeling that was with it? They varied in intensity.. Some very mild some really shock-like. Often they came from the centre of my body. There was a couple of nights where i noticed that sometimes the jerks came from some areas in my body that were extra tense. E.g. if my arm was positioned awkwardly. Slowly, I came to realize that the jerks are HELPING me if I learn to see them that that way. The jerks are a bodily mechanism to get rid of the tension. If I see them as bad then all that happens is even more terror and fear… and more jerks… and more terror.. endlessly… At my worst (1,5 months after my initial experience) I spend a couple of nights at the mental institution.. I have been to that dark place but there is light at the other side.. My experience has helped a couple of other people who have contacted me, so its not just speculation. It does however take time to mentally adjust. Wow were do I start I’m a 35 year old male ive had this most of my life I even have distant memories of these as a child, its not the jerk what wakes me that bothers me that much it’s the fight or flight feeling that comes with mine and no amount of positive thinking stops that adrenaline from being released it can’t be healthy to have your heart go from zero to one hundred multiple times a night thousands of times a year – add that to the strain it puts on work and relationship plus the fact you don’t get enough REM sleep which is important for healthy brain function I’m worried as ****, I’ve never taking sleeping tablets as I’ve always been scared of them, so I’m asking anyone on here who takes sleeping tablets when you do take them do you still have the jerks just as you fall asleep whilst taking the tablets because this scares me with the heart being un naturally slowed and then the adrenalin release. Can’t be good !! and one more thing if you could have one answer from the product to the tablet that really has made a positive please answer below . I have hypnic jerk for a few years and it took me at least 2 to 3 hours to fall asleep. Recently, I come across TRE which is trauma release exercise and have been practising it everyday. When you search the internet, there are many ways to practise TRE but I choose one that is easy to follow and I spend about 10 minutes on TRE. The hypnic jerk is still there but I am able to fall asleep within 1 hour. These can happen many times due to an excess of norepinephrine, which can cause weird and sometimes frightening things to happen with our mind and body. The first step, to get us out of running on norepinephrine is by switching our brain chemistry to running on serotonin and then dopamine. The unusual thing about this is we can actually change our brain chemistry without drugs, herbs, or other potions. 1. To move from norepinephrine to serotonin do one or more of the following – Lie on the floor for a few moments, or do some light fiction reading, or listen to soothing music, or do some coloring or work some simple puzzles, or go for a mild walk outside. 2. Then once your starting to feel a bit better, to move from serotonin to dopamine do one or more of the following: Read educational or philosophical books, or listen to upbeat music, or laugh, or watch comedies, work more challenging puzzles, or do strength exercises or tai chi, or get a massage, or do creative projects, or do things with your non-dominant hand, or learn something new, or go someplace new. a. Make a list of 10 things you really like to do. b. Next, narrow that list down to your top five. d.	Finally pick your top one. e.	Then write a story describing that person who is doing that thing and all the things they would be experiencing while doing that thing, including the qualities that person has. If you have questions, please feel free to let me know. I hope that this can be of value for you to use. Took me off my valium . Have these jerks all the time now. Yes I was on klonopin for 10 years. Got taken off of it 6 months ago and started getting hypnic jerks and scaring the crap out of myself hen I’m sleeping. I scared myself when I suddenly saw a hand and it was my hand! I’ve struggled with hypnic jerk and feel that I’ve overcome it – at least for now. I truly believe it can be conquered but will take diligence on your part. I’m still not sure if it’s: 1) triggered by the brain, sending a misfired neuron, causing the muscle to twitch, or 2) triggered by muscle tension that twitches when your muscles relax going from consciousness to unconsciousness; or could be due to both. Here’s my remedies that address both causes: 1) for the brain, need more serotonin by taking 5HTP supplements (50 mg), 6 mg melatonin, 400 ashwaganda; 2) for muscles, 600 mg magnesium citrate, 400 calcium, 1000 mg vitamin C, don’t exercise late at night, use muscle foam roller on the legs before sleep, and 15 minutes of stretching/deep breathing prior to sleep. Also, stop taking meds, even over-the-counter stuff like antihistamines, drink plenty of water throughout the day, no caffeine, yoga or walking daily to reduce stress, regular sleep schedule. 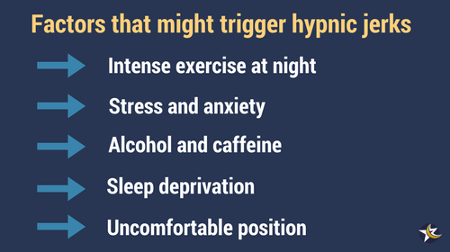 This may seem like a lot of work, and it is, but you can overcome hypnic jerk. Good luck, I know what you’re going through. Thanks for the interesting tips Obie! Which of them do you think work best? Stress and anxiety contributes significantly. I am also beginning to think ailments such as malaria could also increase the occurrence of these jerks. 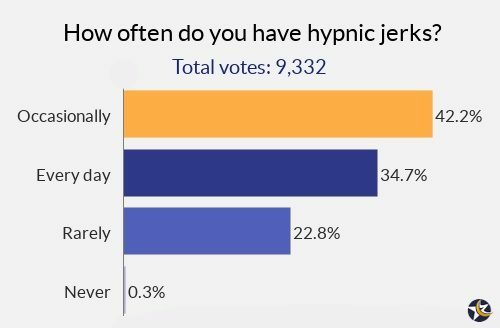 I’m not certain my experience completely qualifies as hypic jerks or whether my dystonia is exacerbating the reactions. I was diagnosed with dystonia over 20 years ago. I experienced a semi-remission period with adjustment of diet to organic. A couple years later, I noticed a slow uptick in symptoms, then the “hypnic jerks” started. The difference is mine are usually symmetrical. It started with a couple shoulder shrugs, then I’d fall asleep. I took it as a good sign. Now, they’ve gotten extremely bad (and so has the daytime components of dystonia). It could take up to an hour to hour and a half for them to stop. They are very violent and can include all muscles of the body. I do eventually fall asleep, but my muscles are so sore when I wake up, it’s like I way overdid a workout every night. Weird thing is, why would my worst symptoms happen as I try to fall asleep? Ive been sleep deprived, stressed, consuming alcohol and work a physical job often late into evening pretty much my whole adult life, but rarely experienced this. That is until last week. I’ve had simple hypnagogic jerks before, but lately I’ve been getting them 5-6 times a night and continuously thru my sleep cycle. Often I can feel the lead up to one about 20 seconds prior. I feel a tickle thru my joints and it slowly becomes a spasm that shakes me. My wife is thinking I’m crazy. The severity of this has led me to look online for an answer…found myself here. Good info and glad I’m not entirely alone in this. Heavy exercise can cause dis I know.. But recently a 10 repetition of abdomen or shoulder exercise cause this in the respective muscle. Toooo bad.. Now not on any medicaltion.. I get these every single time i have a little bit of straneous activity no matter how small… like if i ran to the bathroom with my 2 year old who needed to potty and was about to have an accident. The run was less than 3 minutes. It started ever since i put my mattress on the floor because the box spring was somehow dented, it is uncomfortable makes the mattress really hard although its a gel and foam mattress. But i dont just get jolted out of sleep, most nights i feel like my chest is heavy and my breathing is shallow, my heart pounds faster or harder and i feel like i cant breath… then i try to relax and so i start drifting off to sleep and suddenly BOOM a jolt and i wake up shaking. Ive never snored in my life… and now i suddenly do. I have other unexplained issues and im beginning to wonder if i need to test my hormones. Im just so apprehensive of going to a doctor because they always seem to dismiss what you feel like its nothing or like they know your symptoms best without really investigating the why and how to treat… and i have no insurance. Im taking magensium which i do find it helps most nights but i still get them, i have stopped working out so now im gaining weight, i try to go to bed earlier, idk what else to change…..Im just at a loss. Last night i just wanted to cry i kept getting jolted and waking up shaking. I just really hate this. I want my sleep back. I have had to sleep sitting up in a wing backed chair. It does stop the jerks though the sleep is not completely restful. It may help to break the cycle. Have you looked into sleep apnea? 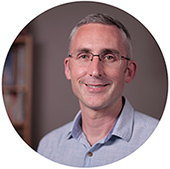 Your story reminds me of a friend’s story–doctors had not picked up on it, but she eventually approached a doctor about potentially having sleep apnea after doing some research on her own about the symptoms, and he verified the diagnosis. She has gained her sleep back since then, and it has caused a lot of other improvements that had previously been hindered by lacking sleep. I encourage you to look into it. I stopped replying to these comments some time ago, but skimming over this reply from Agnes made me look back over Pam’s original comment. And I agree that it’s a possibility from the description, so it would be a good idea to speak to your doctor Pam. I know you said you’re nervous about speaking to a doctor, but if it does turn out to be sleep apnea, treating it can have a profoundly beneficial impact on your life. Thanks Agnes for taking the time to reply here! Hi, Pam. Did you, by any chance, had any botox injection before all these started? I have similar symptoms after botox. To calm down the night twiches i take 2 pills of supplements containing valerian and passiflora and 2 pills of Sedatif PC from Boiron- the last one are homeopat pills. From time to time, when the twiches get worse, i also take a pill of Bromazepan 1,5 mg that night. Some doctors recommended Clonazepam 0.5, i will try this also. The last two i mentioned are serious medicines, so you shouldn’t take them without a doctor’s prescription. Anyway i think they can be bought only on special prescriptions from a doctor. Try taking paracetamol 30 minutes before going to sleep. It seems to help me each time I take it. I’ve been having multiple frightening jerks for the last several months and the paracetamol is helping. Thank you for doing the study. I get hypnic jerks often and understand more so on why I get them. Going to try the techniques and hope for the best. Hopefully a good night for all. I finally found the answer to hypnic jerk and manage to stop it 100% and it never return.the magic is COD LIVER OIL & vit C fruits ( not supplement). I’m living no stress life now and enjoy life normally as my sleep improves, and my arthritis pain gone with it too ? I am taking Ghee and coconut oil. That seems to work for me. I get them every night even tonight reason how I found this article. I swear to god it’s not a falling sensation it’s like my panic disorder going into fight and flight mode thinking I’m about to have a heart attack as it makes me jump and I mean to the point my partner saw it and got a fright of his life. I use a cpap machine too I’m waiting to go into another sleep study as this has only been going on since I got the machine. It’s weird another sensation is y head like a sudden shock so my brain goes into flight mode thinking it’s something bad. It’s physical and mentally draining. I hardly drink or drink coffee either so my guess it might be more me being more physical of a night getting stuff done around the home. Thank you for the great information. I suffer from anxiety and depression and night sweats. I am medicated but try to keep it at a minimum. I get these hypnic jerks occasionally. But it is nice to know it is not serious. Man Oh man I thought that I had something seriously wrong with me until i read through this article, i am being treated for restless legs syndrome but the ropinarol tablets don’t work that well. I suffer from this every single night and have really violent jerks coming from my spine and legs and i am lucky if i get 3hours sleep a night.